INTRO: Eastern Europe’s very first co-production between three territories is now set to premiere in early June and has been picked-up for worldwide distribution by Beta Film. 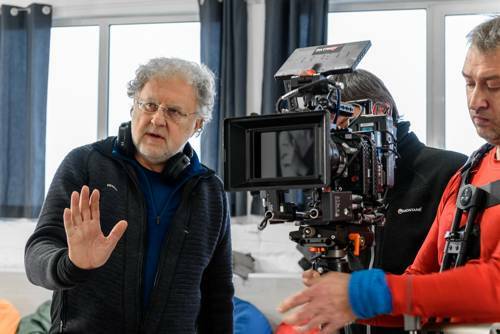 Multiple award-winning director and producer Dariusz Jablonski, founder and CEO of Apple Film, talks about how the production came together and why he believes it will be a success on the international stage. Q. You already have quite a lot of experience producing internationally with Spies of Warsaw and The Passing Bells, with BBC picking up worldwide distribution in both cases. On top of this, Beta Film obviously believes The Pleasure Principle will be another win. What about this production intrigued you? A. The script was excellent and the storyline is multi-layered and fascinating. The lead detective, as an example, is a woman whose unique world view—she comes from a family of musicians—helps her solve the crime. And we don’t show much actual violence in the series. Rather, the story is about the universe that surrounds the crime––that is the victim, the perpetrator and detectives from essentially different countries and cultures who solve it. Q. It’s a co-production between three territories but the cast is from four territories and it includes some of the best actors in Eastern Europe. A. Yes. The script was interesting enough that some of the best actors in Europe wanted to come on board, including Czech actor Karel Roden (Hell Boy, MacMafia/Bourne Supremacy), who works almost exclusively internationally, Polish film and stage actress Malgorzata Buczkowska (Komisarz Alex/Fugue) and the very versatile Sergei Strelnikov (Ekaterina/Vladimirskaya 15), who actually prefers to do his own stuntwork. Q. You have strong film and TV credentials in Eastern Europe. Tell us how the funding for this come together? A. I grew up on a diet of Polish, Czechoslovakian, Hungarian, Ukrainian, Russian and Georgian film and have always felt a sense of community with the people of Eastern Europe. I speak Czech, Slovak and Russian and as a producer and many of my first co-productions were with the Czech Republic, Slovakia, the Ukraine and Russia. We have a similar communist history and our language base is Slavic but we also have a much longer regional history and tradition in common. Q. So as a producer you already had partners in these countries? A. I have worked in these countries for many years and have long established partnerships there. We have had great success with Canal + Poland in the past, and it was the first to board this project. Public broadcaster Czech Television then joined in. We knew Star Media Group was looking for quality projects and we’d been talking for some time about working together, so this was an opportunity to bring them on board as well. Q. Location shooting was in Warsaw, Prague and Odessa. How was that? A. I think the magnificent location shoots in Warsaw, Prague and especially Odessa, a multi-national port on the Black Sea, is one of the great attractions of this series. We enlisted some of the best DOP talent in the region, including Poland’s Pawel Dyllus and Slovakia”s Martin Ziaran. Q. What is the meaning of the title, The Pleasure Principle? A. The scriptwriter Maciej Maciejwski never explained specifically why he chose this title. But we do know that in Freudian psychanalysis, the pleasure principle is the instinctive seeking of pleasure and avoiding of pain to satisfy your needs. So, there may be a hint there. Q. We know that Eastern Europe’s film culture is as old as Western Europe and giants like Milos Forman, Agnieszka Holland, Miraslov Janek, Pavel Pawlikowski and Ildiko Enyedi have all become well known contributors to the global film culture. Your own history is one of working very closely with Krzysztof Kieslowski in your early days. Is it Eastern Europe’s time now to really move onto the international stage when it comes to television? A. During the communist era, television served as a communist propaganda tool, while film was auteur driven. So there was a deep reluctance of filmmakers to do anything with television. It was only when we saw that the world's best film directors were migrating to television that we began to believe it was possible for high end TV series to tell stories that were intriguing and transformative. I may have had an easier transition than some of my colleagues because I worked on one of the most outstanding series in history - the Kieslowski’s Dekalog, a series of one hour films made at the end of the communist era. Q. People now collaborate at early stages and work with partners all over the world. What predictions do you have for the future of international TV? A. The fact is that we live in a world where my viewer can be anyone, anywhere in the world, and that opens up endless possibilities in terms of creativity, not to mention financing or distribution. Being independent and small does not mean you can’t produce something that will be seen by the world and that is one of the benefits of the new film and TV culture. Now is the time that Eastern Europe can truly reap the benefits of a global audience, but it is also a time when global audiences can reap the benefits of Eastern European creativity and storytelling. Now is the time Eastern European vision, traditions, creativity, and the talent we have in front of and behind the camera can move front and centre into the global storytelling community.